Preheat oven to 350*F. and pour oil into large skillet on high heat. Whisk together flour and all of the spices. Wash steaks and dredge in the flour, spice mixture. I like to press the steaks down into the flour, coating them as completely as possible. When all steaks are coated and oil is sizzling hot, place all of the coated steaks into hot oil and fry on high heat for 2 – 3 minutes on each side or until browned and starting to get crispy. Remove steaks from skillet and place in large greased baking pan, do not stack the steaks on top of the other. ( I like to line my pan with foil that has been greased, just to save on clean up). Pour marinara sauce between each steak, avoid pouring sauce on top of steaks. 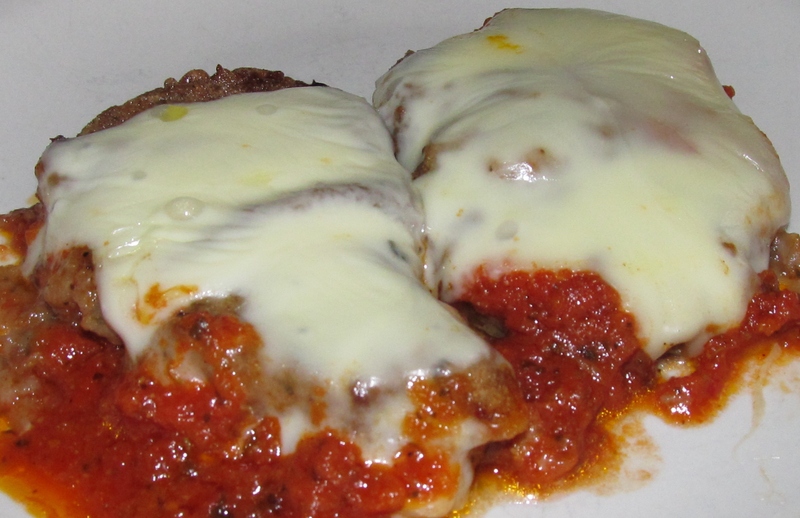 Place in oven and bake for 20 to 25 minutes, until steaks are completely cooked and marinara sauce is bubbling. Place mozzarella slices on top of steaks completely covering each steak. Bake another 5 minutes until cheese is melted. Remove from oven and serve. After plating you can add the grated parmesan if you prefer. Sounds good. Looks good too! Thank you, Kay! Give it a try, the boys and Randy like it.